I’ll be honest: upon first hearing the single ‘Merchant of Lies’, I wasn’t quite sold on Haeredium. Yeah, it’s a quirky little tune, but it’s not really anything special. However, these French folkers have made a bit of an impression on me with Ascension. Their creativity is boundless and their easy, uniquely uplifting brand of metal is quite a pleasant change from so many folk bands who default to the Equilibrium-esque melodeath route. Haeredium’s strength lies largely in their ability to produce music that is new and interesting. The instrumentals are lively and fun and feature a wide array of different styles; in songs such as ‘Images I Recall’ and ‘Fall, they’re driven more by traditional folk instruments, whereas songs like ‘Merchant of Lies’ and ‘Joyride’ are more reliant on the piano to bring a bouncier, funner feel. Where they fall short, though, is in the vocal department. Let me just say that Sébastien Durand isn’t a bad vocalist, especially for a band like this. The music is already fairly laid back and smooth, so his low-key voice suits the music well. The problem is that his voice often falls to the wayside and takes on more characteristics as a background instrument rather than a focal point. This is mainly due to him almost exclusively remaining in a single register rather than venturing out of his comfort zone a bit. In my own humble opinion, a bit more authority and deliberation on the vocal front would take Haeredium to another level. This is Haeredium’s second album to date, and their first to feature their new bassist, Rémi. While the entire band shows solid skill, none of the players make an exceptional performance. The guitar solos, drums, folk instruments, and piano are all really good, but Ascension is very much a team effort. That being said, the album is all the better for it, because the synergy of the band is what makes it great. 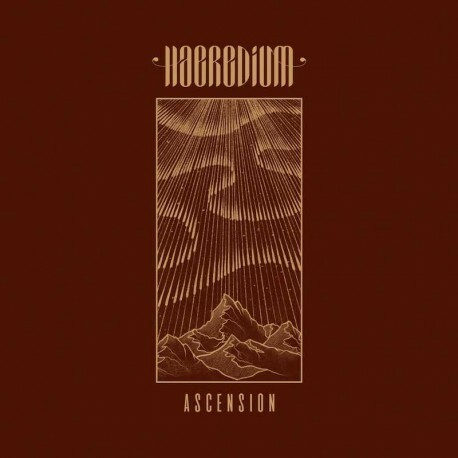 With influences ranging from jazz, bluegrass, celtic folk, and power metal, Ascension manages to stand out in an immensely over-saturated genre of music. Included in its dynamic musical fibres are heavy, more typical power/folk tracks like ‘Alpha Ursae Minoris’, experimental instrumental tracks, and even a handful of hefty eight minuters (‘From Silence’ and ‘Storyteller’) which are packed with different exciting elements. Despite its flaws, this album is great and should be on every folk fan’s radar. This entry was posted in Folk Metal, Power Metal, Reviews and tagged 7.5/10, Art Gates Records, Ascension, folk metal, French folk metal, haeredium, power metal.